I hope you all had a great weekend. Ours was fabulous and I was very sad to see it end!! I am happy to say I took my test on Saturday, so I no longer need to study, which is just fabulous because it means I have more time to craft! Yippee!! Ok, so I found a ton of challenges that I wanted to participate in today. I'm not sure exactly when I started chasing challenges again; but I've definitely been bitten by the bug once more! Since there are so many of them, I'm going to go ahead and start the list. Have a great afternoon, everyone! Hearts, and Purple and White, Oh My! I hope you are all having a lovely day so far. Mine is well. I should be studying for my test...but I'm not! LOL Ugh, I will be so happy when Saturday comes and goes and the test is over. As for today's card, it was super easy to make. Only took about 30 mins and I was able to incorporate a lot of challenges into it. The sentiment is from OCL "Say it Big"
Nothing fancy; but I do like the way the white on white looks. Will definitely have to remember it for future creations. I decided to take to pictu res simply because I wanted to emphasize that the card is white, not lavender. Anyhow, here's the list of challenges I entered this one into. Have a great day! Once again I am caught behind schedule, so I am just going to post this very quickly and list the challenges that I am entering it into. One other quick note. I have started a new blog, called "Interpretations of this Crazy Life" It's brand new and just a hodge podge really of random subjects that pop into my head. Everything from TV, to politics, and parenting. There is no crafting on it; but I would love for you to take a look at it and let me know that you think. New followers would be awesome there also! Ok, so here's the list of challenges. I know this is a pathetically small post; but I don't know really how much more can be said about this one! LOL!! I am here super quickly this afternoon to post my card. It is almost time to pick up the kids from school; but I wanted to get this up for you. I have been so busy studying for a big test I have to take on Saturday. Good gravy, I will be so happy when that silly thing is over!! Anyhow, my card today was inspired by K. Werner's Finally Friday card. I just absolutely adored what she did with the buttons! 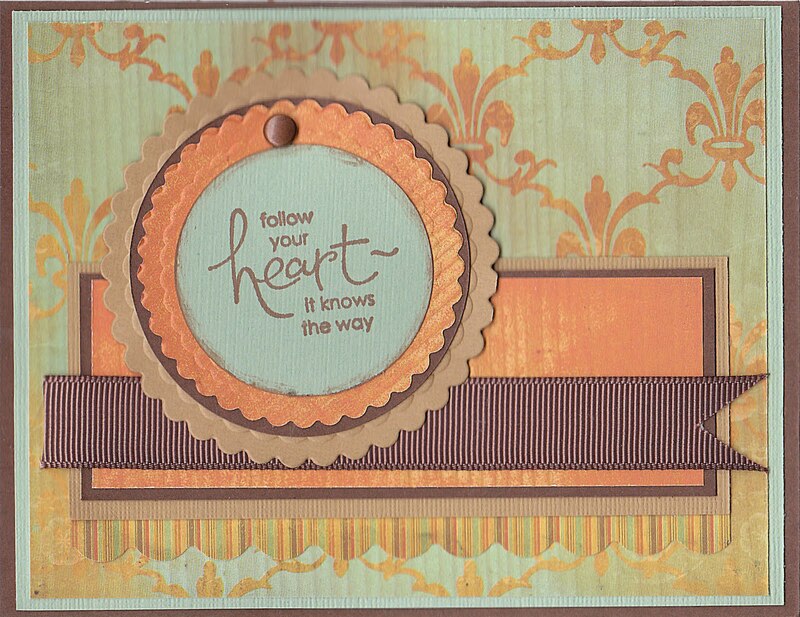 I used Really Rust for my background and some pattern papers from the Sasha Collection from Prima Marketing. 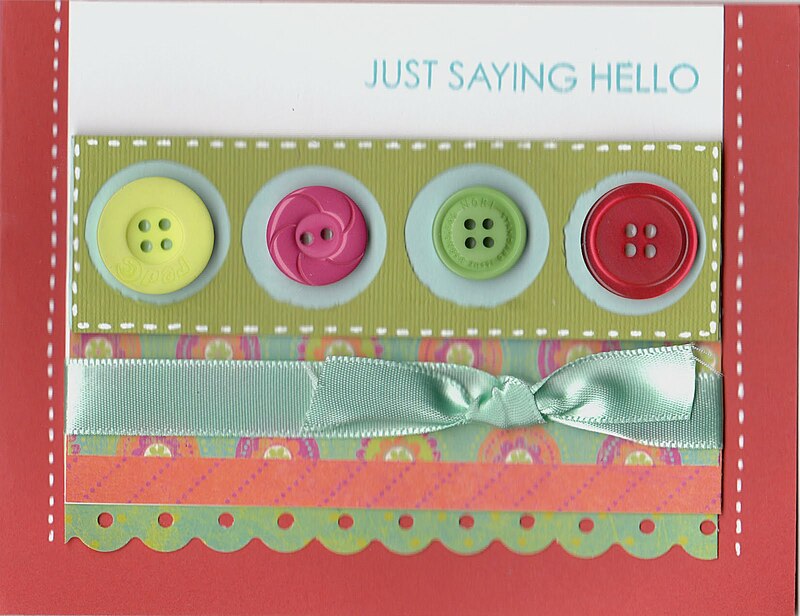 The buttons are just random ones that worked with the paper and colors! Anyhow, I hope you like it. I am off; but will be out wandering through blogland a bit later. After all, I am going to need a study break, or two....or three!! TGIF. I am glad the weekend is upon us, finally. I'm not sure who's idea it was to put 5 whole days between Monday and Friday; but I personally don't think it was a good move! LOL! Ok, so just a quick card to share. I actually decided to check out the list of challenges over at "Feline Playful" and found a couple that my card fits. I made a little list at the bottom. Not a lot of need to go into great detail about this one, I think it's all relatively straight-forward. I wanted to do something classic, and I couldn't think of anything more classic than black, white and red. I think I'm going through a white phase! I seem to be using a lot of it lately. I am going to get this linked in the appropriate challenge sites and then spend a bit of time traveling around blogland. Have a great weekend, I'll see you on Monday! Some of you may be thinking you've already seen this card today and you may have. I actually posted it twice but for different reasons. If you somehow ended up on this post from Twitter in regards to my tweet about Becky H, you need to go to this post instead. 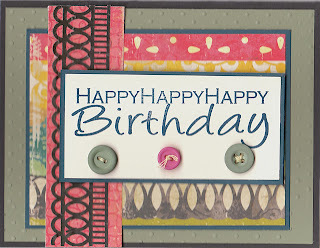 For those of you who are my crafty and stampy friends let me tell you about my card for today. This is for yesterday's SCS sketch challenge. I started out knowing that I wanted to use my flower from Fifth Avenue Floral. Another neglected stamp set (mmm, seems to be a theme this week!) I don't use this set nearly as much as I would like simply because I don't know what to do with it. I made two discoveries regarding this set today. The first is that it is easier to color something and then stamp it and then cut out the rose rather than trying to color it in after you cut it. I brayered some Ruby Red and Cameo Coral ink onto glossy white paper and then stamped the flower in Memento black ink and then outlined it with diamond stickles. I chose Smoky Shadow, Ruby Red, White and Sage Shadow for my color palette. 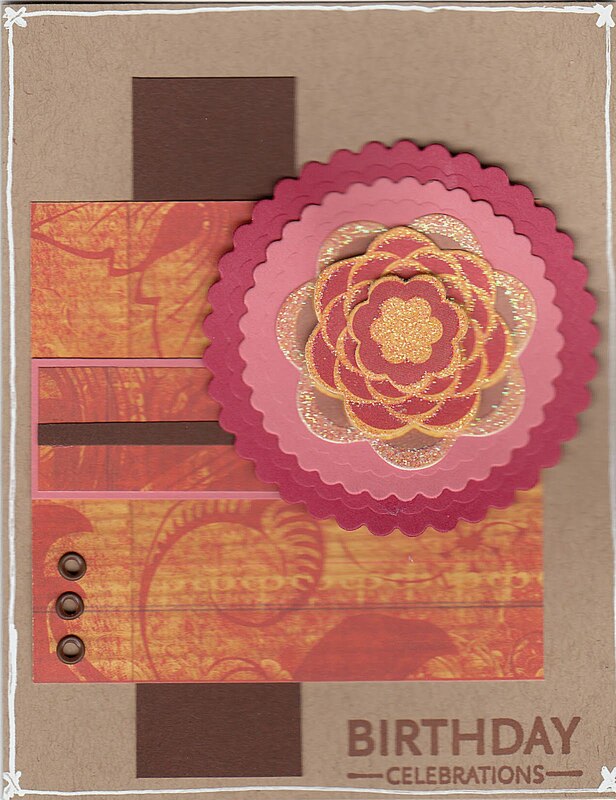 Since I wanted the focus to be on the rose, I opted to just use one cuttlebug folder on the other panels of the card. Have a fabulous evening and I will see you all tomorrow! The first time I saw you on General Hospital, my initial thought was "Who is this snarky little brat?!" I didn't know who "Elizabeth" was or why she was important to the history of Port Charles. I figured I could stomach your sassy little bad girl wannabe character for a few months and then you'd be gone and I'd never have to see you again. Then, you know what happened? In no time flat, I went from "Who's that little brat?" to "Where is that spunky girl, I thought I didn't like?" I found myself drawn in by your presence on screen; and realized that I began to be disappointed when you weren't there. I feel as though those of us who have been with you from the first days in Kelly's diner have watched you take the character of Elizabeth from someone no one knew anything about to a character so entwined and deeply rooted in the canvas of the show, that losing Elizabeth is like losing a little piece of the foundation on which we have all built our love for the show. Some of us are from the "newer generation" of General Hospital fans. We weren't here for the Luke and Laura, Robert and Anna Scorpio, great adventures of the 80's era. For many of us, like myself, our first memories of the show are of Elizabeth and Lucky, Emily and Nikolas, with Eli's Ribs, brownies, guitars and boxcars. We still laugh at the memories of Elizabeth saying "We'll See" the first time Lucky told her his name. It makes us smile when we remember the sleepovers that Elizabeth and Emily had so they could giggle and gossip like girls do. We still feel our hearts break when we remember her collapsing into Sonny's arms thinking Lucky had perished in the fire. We know we'll never forget Elizabeth crawling out from the bushes on that horrible night, and we still get tears in our eyes when we remember how Lucky saved her both that night and beyond. The pain and devastation of finding Lucky with Maxie was so palpable we were ready to hate Lucky forever (well, at least I was!!) The reason we remember those moments, Rebecca, is simply because you brought so much life to Elizabeth. Portraying her with such talent, such grace and above all else passion. Those people who don't like Liz, still have respect and fondness for you as an actress. It has been a magical journey watching Elizabeth grow from a misguided teenager to a passionate lover, a best friend, a survivor and a mother. There is no doubt that if anyone else had been playing this character, we would not feel as awful as we do about your departure. For me, as a fan, I simply wanted to tell you that I am "impressed, amazed and inspired by you" I wish you nothing but the best and happy hopes for a bright future in your career and with your family. I will be watching closely to see where you land and rest assured, no matter where it is, I'll be there cheering for you always. Hi Every one! Well, have I got a treat for you. Not one; but two cards to share with you today, so grab a beverage and a comfy chair and sit back and join me for a few moments. 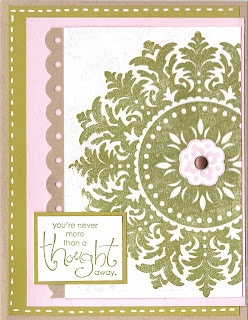 The first card that I have to share with you today is for this week's color throwdown challenge. I don't have the exact colors; but I think I found a few that made a comparable substitute with what I had on hand. I also decided to use my Medallion stamp. That is another one of those stamps that has been long neglected. I was pleased with the results and will have to remember that I really do like this stamp and not leave it sit in the drawer for such a long time. Now, the second card I have to share with you is actually for a new challenge that I recently discovered through a new blog, Simplicity, that I found. I know, I know, just what I need another challenge. This one, however was just too inspiring not to at least try. The "One Layer Wednesday" challenge just looks to be so much fun! 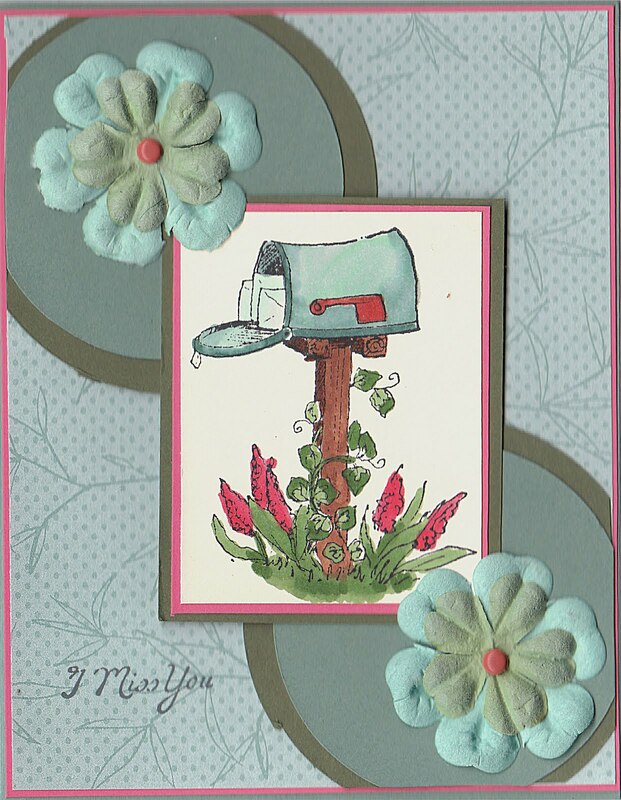 The challenge this week was to use two or more sentiments on your ONE layer card. Sentiments only, no images at all. I'm afraid it may be a bit hard to see in this photo; but I did do a bit of paper piercing beneath the ribbon. I was pleasantly surprised at how much I really liked the way this card turned out. Ok, well, I better go so I can get these linked up in the right places and then spend some time visiting blogland! I hope you all enjoyed your day off yesterday, if you were lucky enough to have it off. Mine was good, except for the fact that both the boys are sick and consequently are home again today. Ah well, the joys of motherhood! I made this card very quickly this morning for yesterday's Mojo Monday sketch. 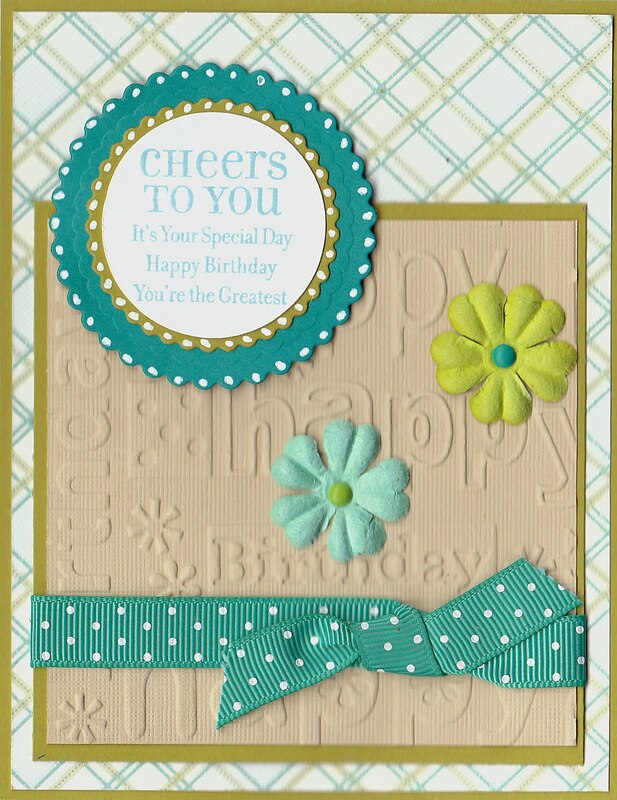 I used Simply Chartreuse, Taken with Teal, some beige and white paper for my solid card stock colors. The pattern paper is from DCWV "Linen Closet". I decided to use my much neglected "Happy Birthday" embossing folder. The sentiment in the circle is from an old SU sale-a-bration set that I can not remember the name of. LOL! So, super simple card. Thanks for stopping by. Enjoy the rest of your day and I'll be back tomorrow! Happy Sunday. I know it's a bit unusual for me to post on a Sunday; but I don't know if I will get a chance to post tomorrow since the kids are out of school . I am posting this card in two challenges this week. 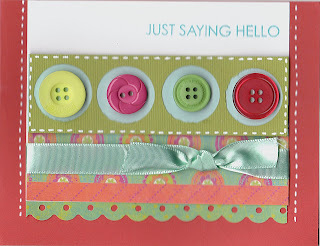 The first is for OCL's Supply Challenge to use 2 different types of ribbon or trim. Technically, I used three; but it's hard to see the Aqua Mist ribbon at the bottom. So, I decided to add the silver cord around the Poppy Red ribbon (from PTI) just to make it a bit more clear. 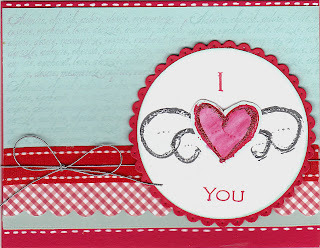 I chose my third free set that I got from OCL "Love Notes" Such a fun set and it may actually inspire me to make some more Valentine's Day cards. Usually, I'm not one to make a whole bunch of V.Day cards. I don't know, I guess we all have our holiday card preferences! The second challenge that I'm posting this for is Speedy's Friends Challenge #38. 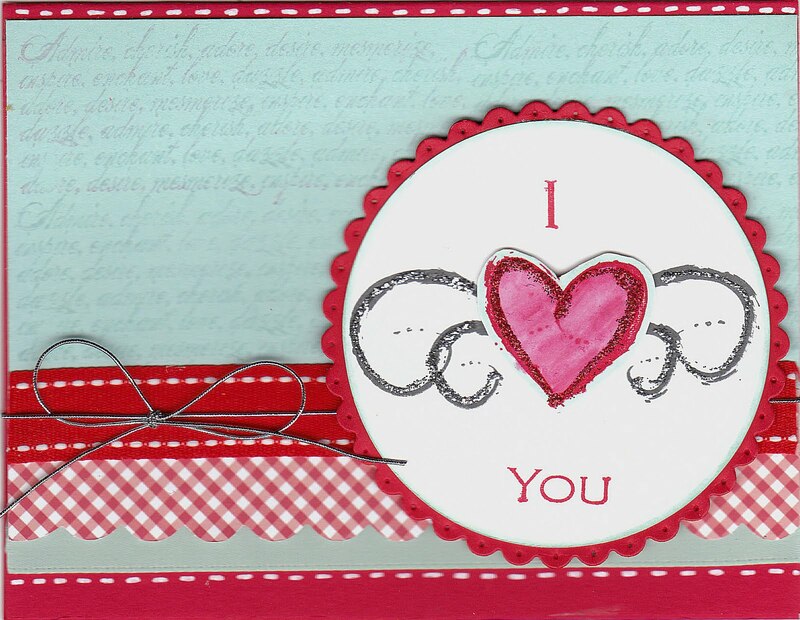 This challenge was to use hearts somewhere on your project. This is a new challenge for me; and I hope to play along with them on a more regular basis. So, that's all for me. I shall be back Tuesday...maybe Wednesday. Until then, enjoy your Sunday afternoon and if you have it, your holiday from work or school tomorrow! I hope everyone is doing well this morning. I'm here to share my card for yesterday's SCS sketch challenge. I really liked the simplicity of this sketch. I'm all about the easy to do rectangles and squares, so this one was perfect. Once again using stamps from OCL! Hey, I got free stamps...of course I'm going to use them!! This time I chose "Treasured Friend" I stamped the image with Memento Ink in Rich Cocoa and then did a bit of shading with my Copic Markers. 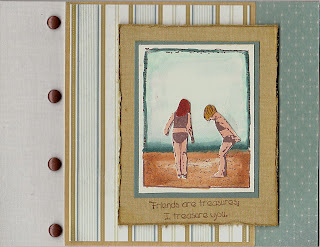 I stamped the two little girls separately and then cut them out and adhered them to the beach background. 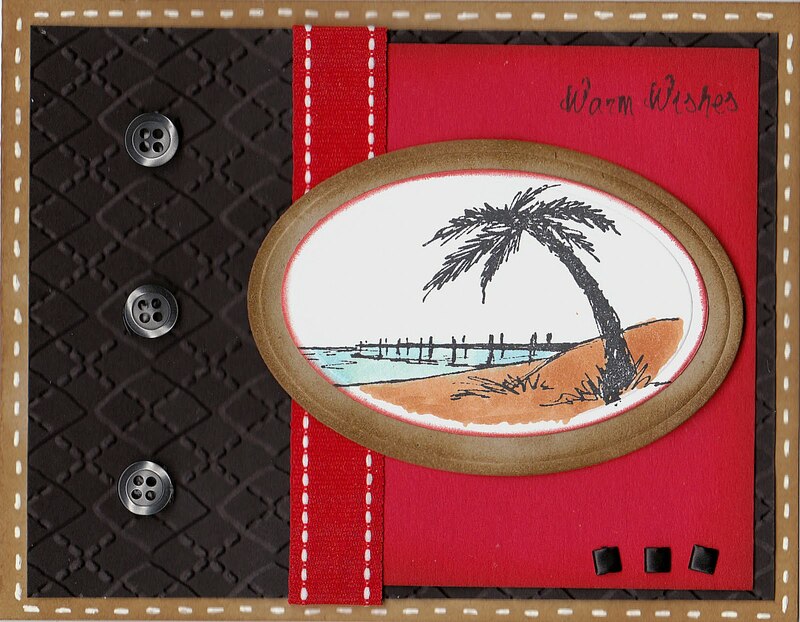 I thought that the papers in the "Linen Closet" collection from DCWV had the perfect colors to go with the beach theme of the stamp. I really like using pattern papers a lot because it helps take out a lot of work with the card and helps the card come together more quickly! I did a bit of distressing around the center panel before attaching the image. Then I ran the edges along my Antique Linen Distress ink pad. Finally, I added the brads and completed the card. Ok, I'm off to study some more. Have a fabulous day everyone! Here is my card for yesterday's Tuesday Morning Sketch. As you can see, I flipped it because I thought it would work better with the image that I used. I would love to go into a lot of details about this; but I want to get some more stamping done before I have to get back to studying for my test. I will say that I the stamp set I used is "Ducky Days" from OCL. This is one of the stamp sets I chose as one of my prizes for winning the Blinkie Contest for last months "Thankful for You" promotion. It is an adorable set, and I am looking forward to playing some more with it. 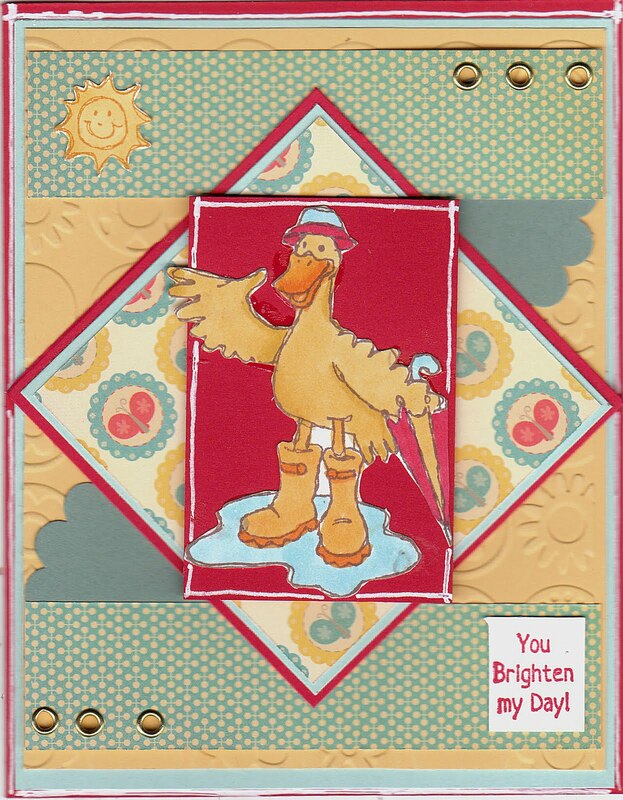 The pattern papers are from Cosmo Cricket 6x6 Togetherness Pad. I hope everyone had a very nice weekend. Ours was good. I have been quite busy studying for my recertification exam for teaching. Oh my Goodness, it's so much material to know! I did finally take a break from all the reading this morning to make this card. 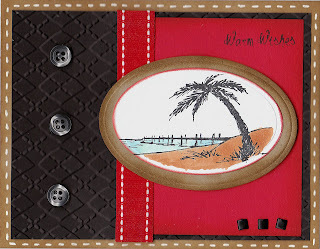 This is for today's Mojo Monday sketch as well as for Friday's OCL color challenge to use Kraft, Red and Black. I chose "Coastal Wishes" from OCL as my stamp set, and I stamped in on Gina K Luxury White card stock and colored it in with a few Copic Markers. It's a simple easy card and I hope you like it. Ok, back to the books! I'll be back to share some more in a couple of days. Happy stamping everyone! Well, I had grand plans to post this early this morning and then do some stamping and quite possibly post another card again. As you can see, that didn't quite work out!! Oh well, I suppose one card is better than none right! I made this card for this week's SCS sketch challenge as well. I really liked this sketch because it is just rectangles and squares. Sometimes circles and other shapes are challenging. I focused a lot on using patterned papers with this card and that in turn helped me to finish the card in a decent amount of time. I think this one only took me about 30 mins to do! I started with a piece of charcoal grey from PTI and added a layer of Mellow Moss that I ran through my CB with the swiss dots folder. Next I added a layer of patterned paper from Crate Paper's Restoration Collection that I matted on a piece of Not Quite Navy from SU. The pink pattern paper is also from Crate Paper. The adhesive lace ribbon is from Basic Grey. The Happy Birthday Sentiment is from OCL's "Say it Big" and is stamped with Not Quite Navy ink on Vanilla card stock. 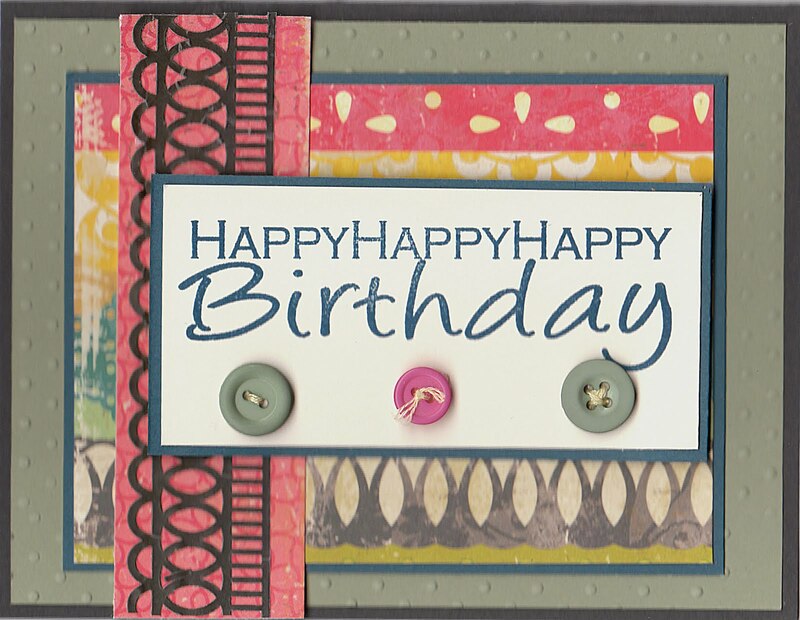 Finally I finished the card with a few random buttons. I hope to find some time to stamp again this weekend, and I hope you do too! Posting early this morning before I get the minis up for school. I actually made this card yesterday, but was a bit lazy about getting it posted. We got a new big screen TV for Christmas, and well...let's just say it is NOT helping my TV addiction! Especially right now, since the hubs is out town and I have complete control of the remote. LOL!! 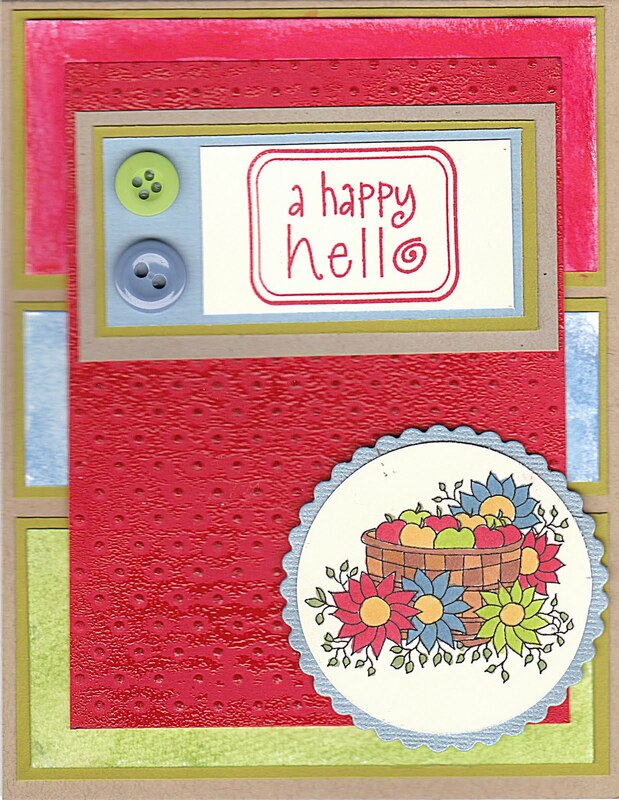 This is my card for this week's Color Throwdown to use Artichoke, Baja Breeze and Cameo Coral. I actually don't have any Baja card stock; but I did manage to find some of this old SU pattern paper and I also substituted a bit of Ocean Tide from PTI. I figured it was a close enough match that I'd be ok. Now, I have to be honest and tell you that I didn't much c are for the Cameo Coral with this color combo. I don't know...just didn't set well with me, which is why I used it very sparingly on the card. This is also for Tuesday Morning Sketches this week as well. It was an easy sketch to work with, so thank you for that, Melissa! 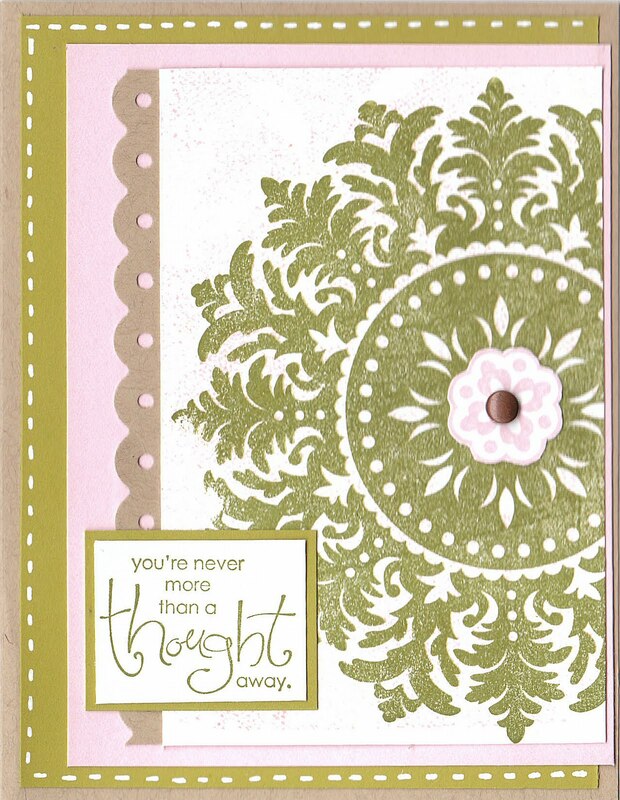 I used OCL's "Garden Thoughts" set for this card, which brings me to the oh so good news I wanted to share with you. Guess who won herself Three OCL Stamp Sets?!! Yep, that's right...little ol' me! I won the "Blinkie" contest that they ran in Nov/Dec for their "Thankful for You" promotion. I was completely and utterly shocked! I can't wait to get my new sets and play with them, ya'll know I LOVE me some OCL stamps!!! Ok, time to get some breakfast on the table. Have a great day, everyone! I hope you all had a fabulous holiday season. Mine was quite nice with lots of traveling and family and friends. I am very happy to have things back to normal, though! 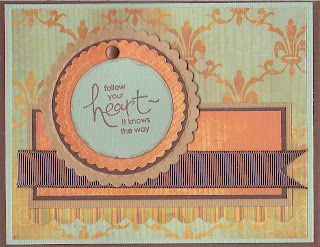 I decided to jump right back into stamping this morning with Mojo Monday. Now, I was rather disappointed when I scanned this card, because the Melon Berry that I used looks more pink than the orange tone that it really has. I could have used the camera; but I didn't....so this will just have to do. 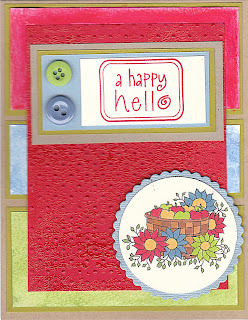 I use Kraft, Choc Chip, Ruby Red, Melon Berry and patterned papers from Cosmo Cricket "Wanted" 6x6 pad. 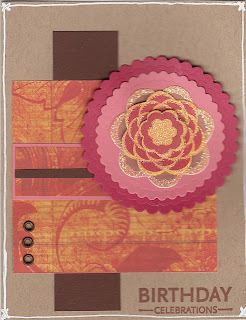 The flower die cut sticker is from K&Company Wild Saffron Flowers. Finally, I added the sentiment at the bottom from Upsy Daisy with Chestnut Roan ink. Anyhow, so just getting back into the groove of things. Have a great day!